Natural white light, best-in-class intensity, energy savings and longevity - all on a highly-positionable K-arm. Higher illumination in a precisely controlled beam is just the beginning. Delivering value through longer life, lower energy consumption and versatility is where the Super Exam 50® LED really shines. The LED technology in this highly engineered optical system delivers the precisely controlled natural white light that is so important for an accurate examination whether your practice is obstetrics, gynecology, dermatology or emergency medicine. Burton has taken its 80 plus years of producing the healthcare industry's finest lighting instruments to new levels with the launch of its LED series. Utilizing only 15 watts of power, the Super Exam 50® LED produces the light output equivalent to 50 watts of conventional lighting. That represents a 70% savings! Rated at 40,000 hours of life, the Super Exam 50® LED lasts 10 to 20 times as long as conventional task & examination products. It is no wonder why LED technology is sweeping the healthcare market and Burton is there leading the way. 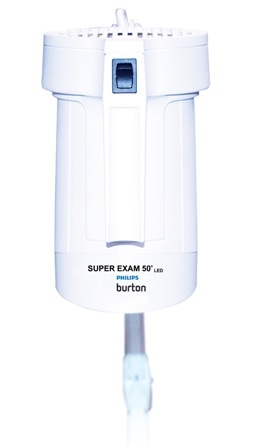 The Philips Burton Super Exam 50 LED Wall Mount Exam Light 120V SE50LW is an incredible buy in a wall mount exam light.